I’m sure you’ve seen these eye cream advertisements. The subject: People with very prominent eye bags. The message: Apply the magic cream and… ZIP! Before your very eyes, those eye bags vanish. First reaction in most people? Wow. Others, less incredulous, want to know what is going on? The standard ingredient in these “miracle” eye creams is Acetyl hexapeptide-3 (trade name Argireline). It’s promoted as an alternative to Botox. Botox reduces wrinkles by paralyzing facial muscles. Argireline works by temporarily limiting the overproduction and release of neurotransmitters which control the intensity of facial muscle contractions. The effect is similar. Applied to your skin, Argireline relaxes facial tension, leading to a temporary - in this case a several-hours-long - reduction in the appearance of facial lines and wrinkles. Here’s the problem I see. The neurotransmitters inhibited by the release of Argireline are the very ones that maintain facial firmness. So will Argireline promote facial sagging in the long run? It definitely looks that way, but I’m not willing to serve as a guinea pig to find out. I prefer something perhaps a bit less “miraculous,” but something that will actually nourish, firm, and protect my under-eye area without any negative side effects. Three scientifically documented, patented ingredients from France caught my attention: Matrixyl® (for wrinkles), Haloxyl® (for dark circles), and Eyeliss® (for puffy eyes). After doing my own research on all three, I decided to include each of them in my RevEYEved eye cream. Let me share with you what I learned. The first breakthrough ingredient is Matrixyl. What is it, anyway? It’s a peptide. More specifically, it’s built from peptide fragments which function as “messengers” in the tissue repair process. It’s intended to replace retinol and related compounds in combating wrinkles, and—here’s the part that’s got us most excited—without any risk of toxicological damage. What’s more, the desirable effect of Matrixyl equals or exceeds that of retinol. Matrixyl works. In one experiment, volunteers were (blindly) given either a 5% Matrixyl cream or a placebo. Those with Matrixyl achieved, in just four months, a 27% reduction in wrinkle depth, a 37% reduction in wrinkle volume, and a 13% reduction in skin roughness. Skin conditions for users of the placebo cream ranged from slight improvement to actual worsening. Matrixyl works especially in the eye area. Building skin thickness is one important element in countering wrinkles. Matrixyl, according to all the published studies I’ve seen, shows no known irritation effect. It’s highly safe: safe enough for me to use it on myself—and indeed I’m doing that now. 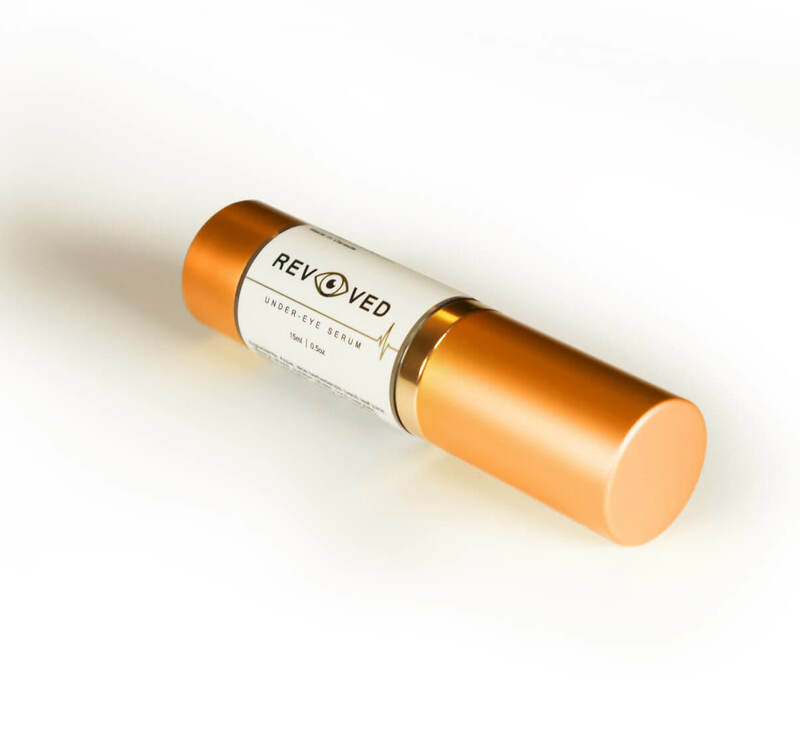 Our RevEYEved Eye Serum’s second anti-aging component is Eyeliss. 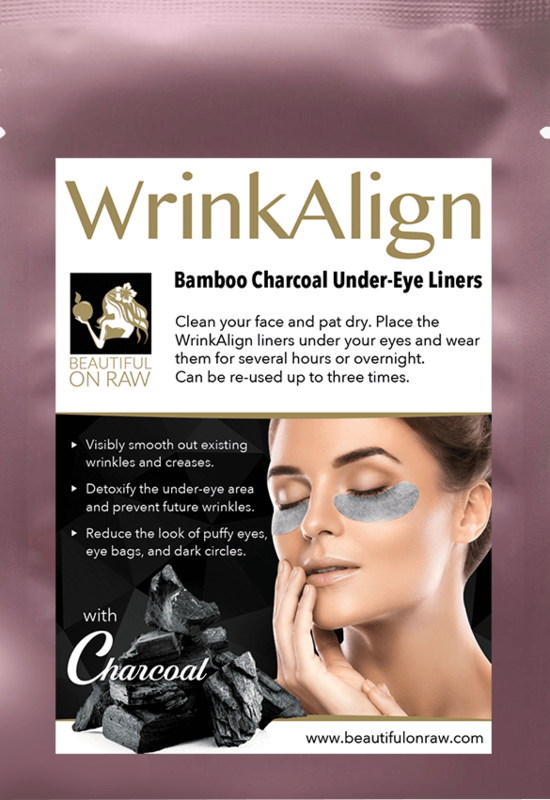 Its function: preventing puffiness and reducing bags under the eyes. It’s a combination of three ingredients, one of which is a plant-based extract, targeting fluid buildup in the under-eye area. The other two are peptides that work on skin elasticity. After applying twice daily for 56 days, 70% of experimental users showed visibly-reduced eye bags. Here’s a tip: If you sleep in your side or on your tummy, it’s hard to avoid a troubled under-eye area. Likely, volunteers weren’t told this. But luckily you have me for that! More information in What is the Best Way to Sleep? Our third breakthrough is Haloxyl, the most effective skin-lightening ingredient out there. This combination of two ingredients is another patented peptide in our new eye serum. 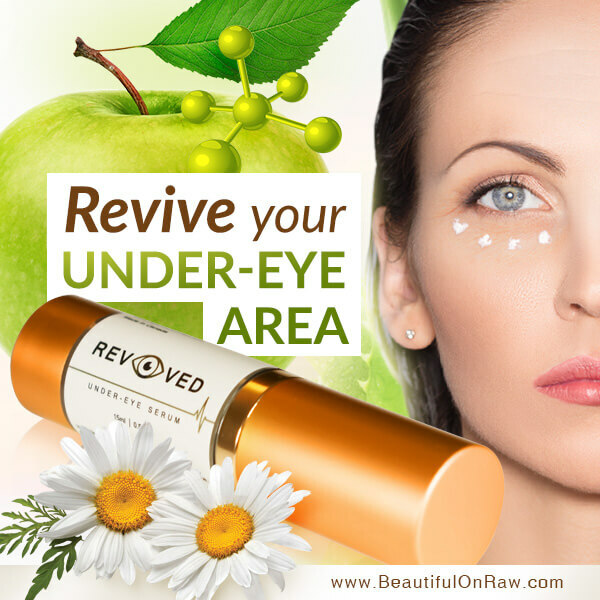 It’s an anti-aging peptide specifically designed to treat dark circles under the eyes. It works by absorbing from the blood the very pigment which is responsible for dark circles, making the skin appear lighter. In clinical studies, Haloxyl also showed the ability to reduce inflammation associated with dark circles. Daily application of Haloxyl to the dark circles for 56 days reduced the red and blue colors of dark circles have by 19%. “That’s not much,” you say? It’s time to get real. There are no miracles. Truth be known, in the realm of topical solutions, these three ingredients are the best the science can offer for keeping your under-eyes youthful. In our eye serum you’ll also find PhytoCellTec Malus Domestica. To put it a little less grandly: Swiss apple stem cell extract. It’s a well-known fact that the stem cells in the skin have a limited life expectancy. That’s why skin becomes loose and crepey-looking. The manufacturers of this breakthrough ingredient hold that plant stem cells will preserve the vitality of the stem cells in human skin. In studies, everyone who applied a Malcu Domestica emulsion for 28 days showed a visible decrease in wrinkle depth. I wanted this ingredient in my eye serum. Any help science can bring, I’ll take it. How to use: Place a small amount of eye serum on your finger. Dot it on your under-eye area from the inner to the outer corners of your eyes. For best results, do this twice daily. While this serum was designed for your under-eye area, feel free to use it all around your eyes. Every bit helps… 13% here, 19% there, combined with diet, sleeping on your back, juicing, and applying under-eye patches… it all adds up. Sometimes to a ten- or even twenty-year change in the appearance of your skin, bringing with it a younger-looking face. Of course, for anti-aging benefits I’ll continue to rely on raw foods and my beauty routine more than anything. They are the two standbys that have kept me youthful through my 40s and 50s and will continue to do so as I journey into my 60s. Read my ebook Guide to an Ageless Face. Ingredients: Aqua, aloe barbadensis (vera) leaf juice*, cetearyl olivate*, sorbitan olivate*, cococaprylate*, glycerine (vegetable)*,palmitoyl pentapeptide-4 (Matrixyl®**)***, palmitoyl tripeptide-1 (and) palmitoyl tetrapeptide-7 (Haloxyl®**)***, hesperidin methyl chalcone (and) dipeptide-2 (and) palmitoyl tetrapeptide-7 (Eyeliss®**)***, malus domestica fruit (apple stem) cell culture extract****, butyrospermum parkii (shea butter)****, tapioca starch****, cetyl alcohol**, sodium hyaluronate**, matricaria recutita (chamomile) flower extract*, camellia sinensis (green tea) leaf extract*, olea europaea (olive) leaf extract*, leuconostoc/radish root ferment filtrate (and) lonicera japonica (honeysuckle) flower extract (and) lonicera caprifolium (honeysuckle) extract (and) populus tremuloides bark extract (and) gluconolactone*, potassium sorbate*. ** trademark of Sederma Inc.